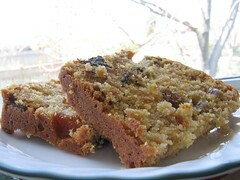 Pistachio and Dried Fruit Cake with Orange - Do You Know The Muffin Man? Notes: The author says her mother makes this cake during Lent so it is a coincidence that I made it for the Easter weekend. Due to ingredient shortages, I made all kinds of little substitutions: a handful of walnuts in place of pistachios, five-spice powder instead of ground cloves, a bit of rum to supplement the brandy, and canola oil for safflower. The cake is rich in flavour but the oils don't provide the same aroma as butter does. Without any eggs, it's also very crumbly.